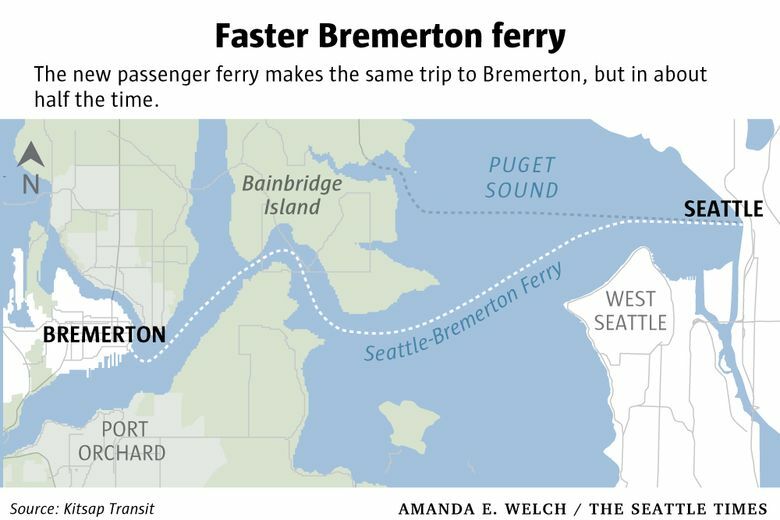 A new passenger ferry will make the trip from Seattle to Bremerton in about half the time that the current Washington State Ferries boats take — at a premium price. Funded by a voter-approved increase in the Kitsap County sales tax, the Fast Ferry launches next Monday. Bremerton to Seattle commuters soon will have the option to cut their commute times in half — for a price. 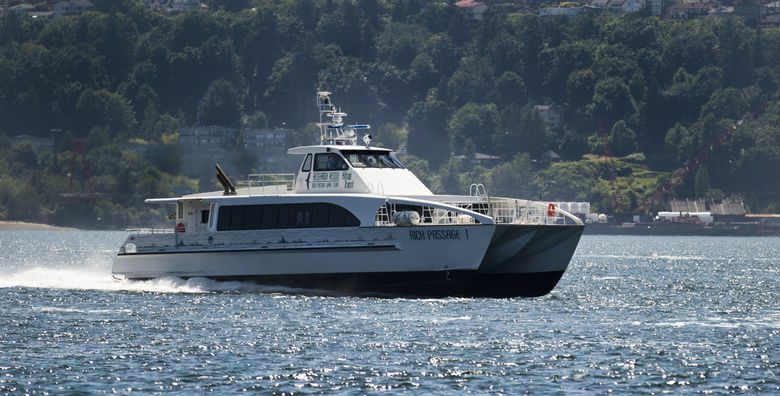 On Monday, Kitsap Transit will launch service on its new passenger-only fast ferry, which makes the trip between Bremerton and downtown Seattle in about half the time of Washington State Ferries’ standard route. 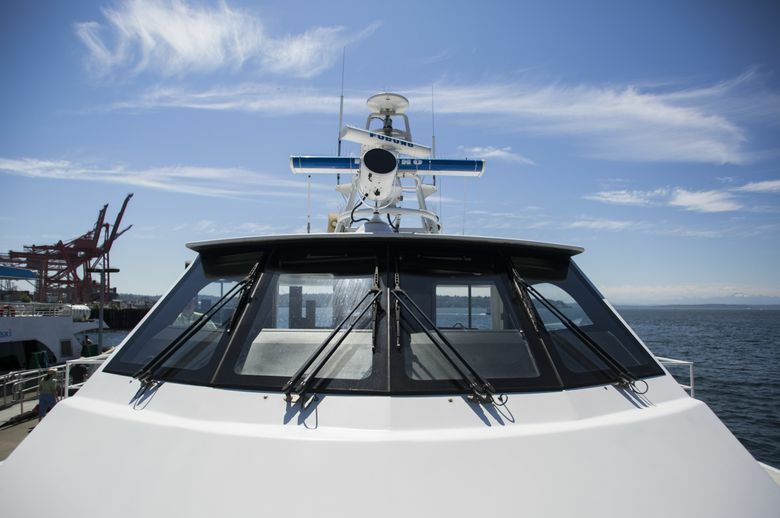 The trip aboard the 118-passenger, low-wake catamaran should take about 28 minutes, according to Kitsap Transit, as opposed to about an hour on Washington State Ferries. The price for cutting the commute by about 50 percent, though, is about 50 percent more than a state ferry ride. The Fast Ferry will cost $12 for a round trip ($2 from Bremerton to Seattle, $10 for the return trip), or $168 for a monthly pass. Tickets in July, however, are free to let passengers sample the service. A round-trip passenger ticket on Washington State Ferries costs $8.20 ($8.20 from Seattle to Bremerton, free for the return trip), or $105.80 for a monthly pass. Like Washington State Ferries, the fast ferry accepts payments via ORCA cards. The boat will initially run three round-trip routes on weekday mornings and three in the afternoon and evening. There will be 10 round-trip routes on Saturdays, beginning just after 9 a.m. and ending just before midnight. Michael Goodnow, president of the Downtown Bremerton Association, said the faster commute would not only improve quality of life in Bremerton, but he hoped it would make more businesses consider locating in the city. Commuters, he noted, have little hesitation about traveling to and from Seattle suburbs, even though those trips are almost always longer (and less pleasant) than a half-hour ferry ride. 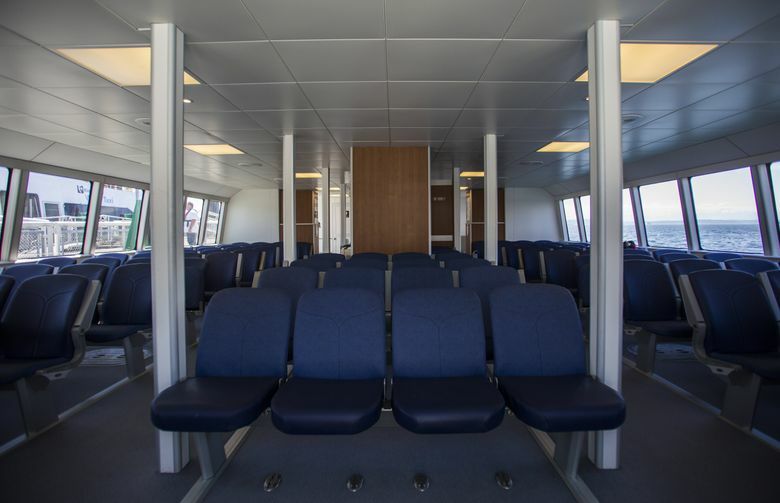 Ferries will accept reservations for 88 seats per sailing (about 75 percent of the available seats), with 30 held for walk-ons. Of the nearly 17,000 reservations available in July, more than 40 percent were taken in the first three days that reservations were open last week. Passengers can carry bicycles on the new ferry, but there can’t be more than 12 per boat, and no electric bicycles. Kitsap Transit expects to expand service in the coming months, but not until it studies the effects, if any, of the fast ferries on the beaches of Rich Passage — the narrow strait that ferries travel between the south end of Bainbridge Island and the Kitsap Peninsula. Washington State Ferries ran a passenger-only ferry between Seattle and Bremerton throughout the 1990s. But in 1999, about 100 property owners on the shores of Rich Passage sued the state, alleging the speedier ferries’ wakes were eroding and damaging their beaches. A judge ordered the ferries to cut their speeds by more than 60 percent when traveling through the passage, and the state paid a $4.5 million settlement to the property owners. The slower trips caused dwindling ridership, which, combined with tight budgets, caused the state to cancel the passenger ferry in 2003. A private ferry service launched in 2004 but shut down in 2007, a victim of low ridership and high fuel costs. 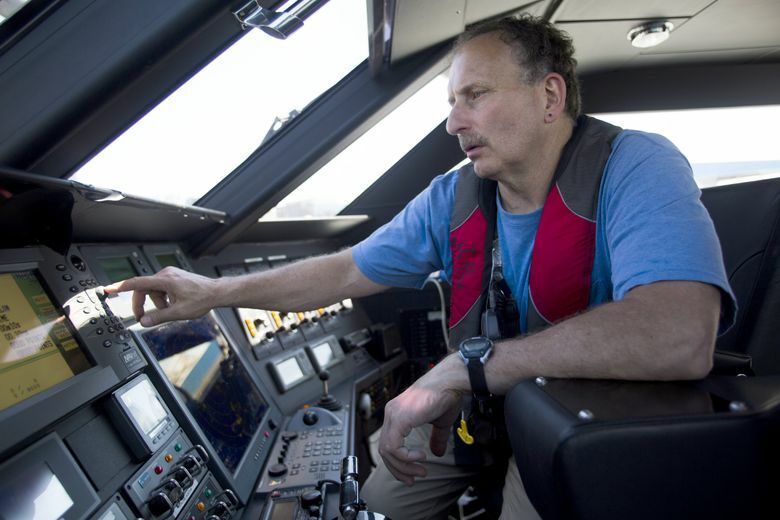 Kitsap Transit hopes to avoid a similar fate with boats designed, after about a decade of research, to minimize wake. The ferries have a hydrofoil — sort of an underwater wing — to lift them higher in the water as speeds increase. When they’re traveling at high speeds (their top speed is 37 knots, about 43 mph) the twin hulls ride only about 18 inches deep in the water. Kitsap Transit plans to expand the fast ferry with service to Kingston in 2018 and Southworth in 2020. 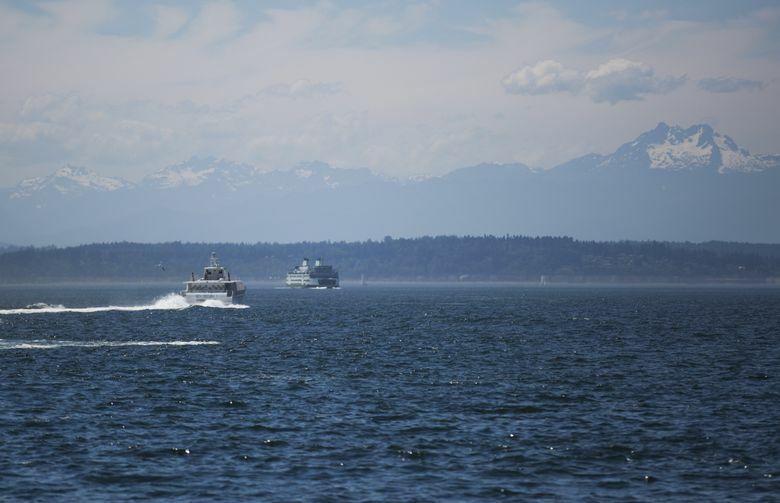 Once all routes are up and running — with three vessels eventually on the Bremerton route and one on each of the other two routes — the agency expects its ferry ridership to more than double its current numbers. The service — and its $48 million startup cost — is funded through a 0.3 percent sales tax in Kitsap County that voters there narrowly approved in November. That tax is expected to bring in a little more than $13 million this year. The ferries will be expensive to run. Kitsap Transit estimates a $21 per-rider subsidy in 2017 with that number expected to fluctuate between $17 and $38 per rider over the next 20 years, according to the agency’s financial plan. 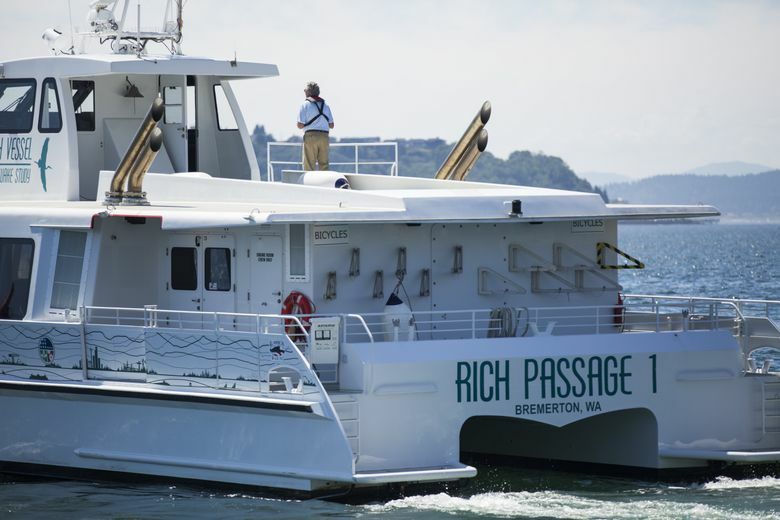 The agency estimates that over the long term, fares will cover about 28 percent of the costs of operating the ferries, a number far below Washington State Ferries, but in line with other local transit agencies. Kitsap Transit had planned on a grant from the Federal Transit Administration to cover about half the $48 million startup costs of getting the fast ferries up and running, but with the Trump administration proposing drastic cuts to FTA grants, they’re no longer counting on federal money. Instead, they plan to sell up to $50 million in bonds, backed by sales-tax proceeds, to raise the money to buy the new ferries and get the service running. “There’s just so much uncertainty right now, and we need to deliver on the promise we made to the taxpayers and voters,” Sanjay Bhatt, a Kitsap Transit spokesman, said.